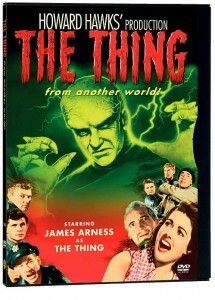 Sunday October 25 10:00 AM THE THING FROM ANOTHER WORLD (1951) 87 min. D: Christian Nyby. Renowned filmmaker Howard Hawks produced this stylish classic about a bloodthirsty alien terrorizing a North Pole research station. A sparkling ensemble cast headed by Kenneth Tobey, Margaret Sheridan, Robert Cornwaithe, Douglas Spencer, Dewey Martin and Robert Nichols keeps everybody warm by clipping off the acerbic dialogue penned by Charles Lederer, Ben Hecht and Hawks. A keen sense of humor was required to combat the dreaded “supercarrot” organism memorably portrayed by James Arness before he patrolled Dodge City in TV’s Gunsmoke.